Have you got what it takes to win gold? The 2016 Banksia Sustainability Awards are open for nomination.This year they comprise 11 category awards, three specialist awards and the Banksia Gold Award. Sponsored: Have you got what it takes to win gold? The 2016 Banksia Sustainability Awards are open for nomination.This year they comprise 11 category awards, three specialist awards and the Banksia Gold Award. Kalleske Wines, a small family business from South Australia, won the 2015 Banksia Small to Medium Business Sustainability Leadership Award before claiming the overall Banksia Gold Award, clearly illustrating how small business can innovate and benefit from sustainability. Kalleske Wines, established in 2002, is the oldest and largest certified organic and biodynamic grape-growing and winemaking operation in South Australia. Situated in the picturesque Barossa Valley, Kalleske utilises grapes from the family property, which has been owned and operated by the family since 1853. Banksia’s judges believe that Kalleske Wines truly are sustainable pioneers in organic wine and praise them on maintaining a healthy vineyard environment where healthy soils, no chemical residues, carbon retention and biodiversity are of key importance alongside employment conditions for vineyard workers. “Initially, people thought it was silly to venture down the organic and biodynamic path,” co-owner of Kalleske Wines Troy Kalleske said. Today, almost 20 years after receiving their organic certification, Kalleske Wines haven’t looked back, receiving numerous accolades for both their quality organic wine and their sustainable business practices, and they’re not slowing down. From solar panels and rainwater tanks to composts and evaporative cooling, the winery has made a significant investment in sustainability and is now reaping the rewards. Kalleske Wines is a net exporter of electricity and is self-sufficient thanks to the 350,000 litres of rainwater captured on site annually. “Being sustainable, the benefits definitely outweigh the costs of what we’re doing,” Kalleske said. Kalleske urged other businesses to enter the Banksia Sustainability Awards. “The whole application process really gets you to focus on your business. I would encourage others to enter because it is a case of benchmarking yourself against other business and reflecting on all that you have achieved,” he said. 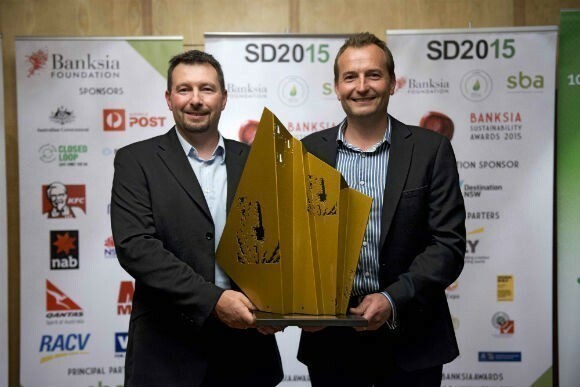 The 2016 Banksia Small to Medium Business Sustainability Leadership Award, sponsored by Australia Post, recognises businesses that demonstrate leadership by integrating sustainability principles and practices into their operational business activities. Previous winners include: Kalleske Wines (2015), Psaros (2014) and Australian Ethical Investment (2013). Have you got what it takes to win gold? Inquire here today. Entries close 26 August 2016.